Need an eclectic, unique privacy window for your home? We've got the answer! 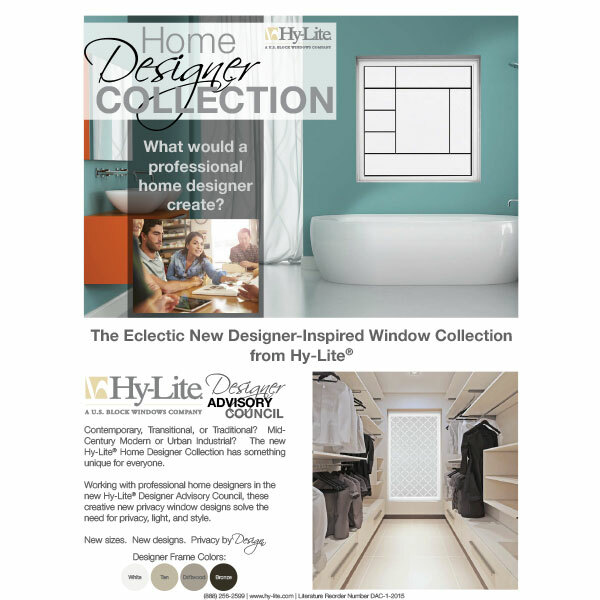 The new Hy-Lite Home Designer Collection of decorative glass windows was inspired by designers from across the country. - Metro - inspired by modern architecture with clean lines and a progressive industry feel, this window features a micro-crossreed texture and a bold three-dimensional design. True low-carbon wrought iron and tempered safety glass make this a stand-out window. Available in a 48" x 48" size. - Mission - a true Craftsman-inspired design, this window is constructed with silkscreened tempered privacy glass and clear diamond shapes on the interior. The fixed unit is finished with textured privacy glass on the exterior and comes in both a 48" x 48" size and a 48" x 12" size. - Prairie - simply elegant, this transitional design is versatile enough to complement a variety of home styles from traditional to contemporary. Created with silkscreened tempered privacy glass and clear lines on the interior and finished with textured privacy glass on the exterior, this window style comes in sizes of 48" x 48", 48" x 12" and 36" x 60". - Baroque - a dramatic, show-stopping design inspired by classic and modern tile, this window provides a unique way to blend texture into a room. Silkscreened tempered privacy glass with clear lines creates this memorable design, while textured exterior privacy glass provides seclusion. Available in 48" x 48" and 36" x 60" sizes.